The site of the city was a part of Rensselaerswyck, a patroonship created by Kiliaen van Rensselaer. Dirck Van der Heyden was one of the first settlers. In 1707, he purchased a farm of 65 acres (26.3 ha), which in 1787 was laid out as a village. As of 2014, Troy is updating its citywide comprehensive plan for the first time in more than 50 years. The two-year process is known as "Realize Troy" and was initiated by the Troy Redevelopment Foundation (with members from the Emma Willard School, Rensselaer Polytechnic Institute, Russell Sage College and St. Peter's Health Partners). Urban Strategies Inc. (Toronto) is planning Troy's redevelopment. The Rensselaer School, which later became Rensselaer Polytechnic Institute (RPI), was founded in 1824 with funding from Stephen Van Rensselaer, a descendant of the founding patroon, Kiliaen. In 1821, Emma Willard founded the Troy Female Seminary. It was renamed Emma Willard School in 1895. The former Female Seminary was later reopened (1916) as Russell Sage College. All of these institutions still exist today. In addition to Russell Sage College (a comprehensive college for women), Troy is also home to the 10,000-student Hudson Valley Community College (part of the State University of New York system), three private high schools: La Salle Institute (Catholic military-style), Emma Willard School (America's first girl's high school and a high-academic boarding and day school) and Catholic Central High School (a regional Catholic high school in Lansingburg section). Northeast Health is now the umbrella administration of Troy two large hospitals (Samaritan Hospital and St. Mary's Hospital). The city is also home to many non-profits including the many good services provided by Unity House, Joseph's House, numerous churches (Orthodox, Catholic, and Protestant), three synagogues, and one mosque. Troy Flag Day Parade – The Troy Flag Day Parade is the largest parade in the nation in honor of the American flag. Early June annually. Troy Pig Out – One of the most loved summertime events in the Capital Region, the Troy Pig Out is a full day of fun where culinary competitors duke it out for best BBQ, and people flock to Riverfront park to taste some of the area’s best food. 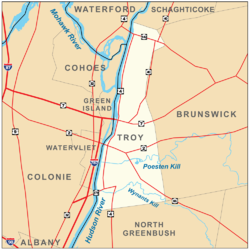 Troy's legislative branch consists of a city council composed of nine elected members: three at-large members who represent the entire city, and six district members who represent each of the six districts of Troy. Currently, there are 3 Democrats and 6 Republicans. Each council member serves a two-year term, and an incumbent is prohibited from serving for more than four consecutive terms (eight years). The city council at-large representative who receives the greatest number of votes in the election is designated the City Council President. The council meets on the first Thursday of every month at 7:00 pm in City Hall, in the council chambers. All meetings are open to the public, and include a public forum period held before official business where citizens can address the council on all matters directly pertaining to city government. ^ "America's Best Colleges 2007". U.S. News. 2006. https://www.usnews.com/usnews/edu/college/rankings/brief/t1natudoc_brief.php. Retrieved 2007-12-01. ^ "RPI History Main Page". http://www.rpi.edu/about/history.html. Retrieved 2007-01-21. ^ "Rensselaer in Brief". 2008. http://catalog.rpi.edu/content.php?catoid=4&navoid=76. Retrieved 2008-05-22. ^ a b Kenneth C. Crowe II (June 20, 2014). "Troy plans for first citywide plan in 52 years". Times Union (Albany). http://www.timesunion.com/local/article/Troy-plans-for-first-citywide-plan-in-52-years-5568732.php. ^ Jim Franco (June 19, 2014). "A company to do a comprehensive plan (NEWS)". T-Spin. http://troyspin.blogspot.ca/2014/06/a-company-to-do-comprehensive-plan-news.html. ^ Robert Breuer, Troy's RiverSpark Visitor Center. Retrieved 1 August 2007. 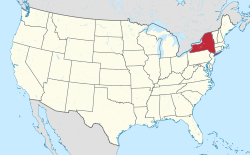 ^ a b "Troy (city), New York Quick Facts". U.S. Census Bureau. Archived from the original on September 15, 2013. https://web.archive.org/web/20130915083120/http://quickfacts.census.gov/qfd/states/36/3675484.html. Retrieved September 4, 2013. 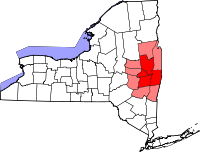 ^ "Troy (city), New York City data". http://www.city-data.com/income/income-Troy-New-York.html. Retrieved February 26, 2016. ^ "Historic Homes of Troy's 2nd Street – Adirondack Girl @ Heart" (in en-US). Adirondack Girl @ Heart. 2014-11-25. http://adirondackgirlatheart.com/2014/11/historic-homes-of-troys-2nd-stree.html. ^ "Troy, NY Special Events". http://www.troyny.gov/community/special-events/. ^ "Troy River Fest – Downtown Troy BID". http://www.downtowntroy.org/troy-river-fest/. ^ "Bakerloo Theatre Project". http://www.bakerloo.org. ^ "Troy Victorian Stroll". https://www.victorianstroll.com. ^ "Troy Turkey Troy". http://www.troyturkeytrot.com. ^ "The Enchanted City" (in en-US). https://www.enchantedtroy.com. ^ "Troy Night Out". http://www.downtowntroy.org/troy-night-out/. ^ "Rockin on the River". http://www.downtowntroy.org/rockin-on-the-river/. ^ "Troy Pig Out". http://www.downtowntroy.org/troy-pig-out/. ^ Greenberg, Peter. "Newsmax Magazine Rates the Top 25 Most Uniquely American Cities And Towns". http://www.newsmax.com/Slideshows/Newsmax-Magazine-Rates-the-Top-25-Most-Uniquely-Am/97791/15--Troy,-N-Y-/16. Retrieved 15 January 2014. ^ a b c d e f g h i j k l m n o p q r s t u v w x y z aa ab ac ad ae af ag ah ai aj ak al am an ao ap aq "National Register Information System". National Register of Historic Places. National Park Service. 2010-07-09. http://nrhp.focus.nps.gov/natreg/docs/All_Data.html. ^ "National Register of Historic Places Listings". Weekly List of Actions Taken on Properties: 12/31/12 through 1/04/12. National Park Service. 2013-01-11. http://www.cr.nps.gov/nr/listings/20130111.htm. ^ "50 years of innovation and excellence". Hudson Valley Community College. Archived from the original on 2007-10-24. https://web.archive.org/web/20071024013549/http://www.hvcc.edu/50/index.html. Retrieved 2009-12-21. ^ "National Register of Historic Places Listings". Weekly List of Actions Taken on Properties: 11/19/12 through 11/23/12. National Park Service. 2012-11-30. http://www.cr.nps.gov/nr/listings/20121130.htm. ^ "National Register of Historic Places listings for July 15, 2011". National Park Service. July 15, 2011. http://www.nps.gov/history/nr/listings/20110715.htm. Retrieved July 15, 2011. ^ "National Register of Historic Places Listings". Weekly List of Actions Taken on Properties: 1/13/14 through 1/17/14. National Park Service. 2014-01-24. http://www.cr.nps.gov/nr/listings/20140124.htm. ^ "National Register of Historic Places Listings". Weekly List of Actions Taken on Properties: 12/09/13 through 12/13/13. National Park Service. 2013-12-20. http://www.cr.nps.gov/nr/listings/20131220.htm. ^ "Troy Gas Light Company, Gasholder House". Society for Industrial Archeology. http://www.siahq.org/about/troygasholder/images/TroyGasholderHouse.pdf. Retrieved 2010-01-23. ^ a b "National Register of Historic Places Listings". Weekly List of Actions Taken on Properties: 2/10/14 through 2/14/14. National Park Service. 2014-02-21. http://www.cr.nps.gov/nr/listings/20140221.htm. ^ "National Register of Historic Places Listings". Weekly List of Actions Taken on Properties: 3/04/13 through 3/08/13. National Park Service. 2013-03-15. http://www.cr.nps.gov/nr/listings/20130315.htm. ^ "Joe Alaskey, R.I.P.". 3 February 2016. http://www.newsfromme.com/2016/02/03/joe-alaskey-r-p/. ^ "Greg Schutz". Fiction Writers Review. http://fictionwritersreview.com/reviews/the-nightingales-of-troy-by-alice-fulton. Retrieved 20 December 2012. ^ "Companion Map to Alice Fulton's The Nightingales of Troy". Google Maps. https://maps.google.com/maps/ms?f=q&source=s_q&hl=en&geocode=&ie=UTF8&msa=0&msid=113392205776745354649.00046e65a4e475e8fba73&ll=42.754701,-73.679123&spn=0.08987,0.128746&z=13. Retrieved 20 December 2012. ^ Skinner, Charles. "Bell Casting in Troy". Archived from the original on 30 June 2014. https://web.archive.org/web/20140630205204/http://fpcdunedin.org/Meneely.html. Retrieved 12 July 2013. ^ Benjamin. "Manory's Restaurant celebrating centennial". The Troy Record. http://www.troyrecord.com/general-news/20130113/manorys-restaurant-celebrating-centennial. Retrieved 9 October 2015. ^ "William Marcy". Biographical Directory of the United States Congress. http://bioguide.congress.gov/scripts/biodisplay.pl?index=M000127. Retrieved 20 October 2012. ^ "John Morrissey". Biographical Directory of the United States Congress. http://bioguide.congress.gov/scripts/biodisplay.pl?index=M001001. Retrieved 20 October 2012. ^ "Edward Murphy". Biographical Directory of the United States Congress. http://bioguide.congress.gov/scripts/biodisplay.pl?index=m001090. Retrieved 20 October 2012. ^ "WARREN, Joseph Mabbett, (1813–1896)". Biographical Directory of the United States Congress. http://bioguide.congress.gov/scripts/biodisplay.pl?index=W000165. Retrieved October 10, 2012. This page uses content from the English language Wikipedia. The original content was at Troy, New York. The list of authors can be seen in the page history. As with this Familypedia wiki, the content of Wikipedia is available under the Creative Commons License.